Phantom Las Vegas Fans of the Broadway hit, Phantom of the Opera will feel right at home in Las Vegas. A $40 million theater was built at the Venetian Hotel and Casino. Sporting a new name and some new elements, such as pyrotechnics, Phantom of the Opera became Phantom � The Las Vegas Spectacular. Everything about this musical is as spectacular as its name. The theater looks and feels like the Opera Garnier in Paris. The sets offer all of the most important details from the beautiful rooftops to the serene detail of the underground lake of the Phantom. Other than some small details, such as the pyrotechnics and other special effects, the musical has stayed exactly the same so die-hard fans will love the new theater and new visitors to the show will love the ambiance and direction of one of the most popular Broadway musicals of all time. The musical has been trimmed slightly to go from close to three hours to about 95 minutes. The cuts that were made were mainly smaller ones from the dialogue or from the intermission. However, the large orchestra and the beautiful music make the whole experience one that you will never forget. The Las Vegas cast of Phantom offers a dynamic performance. The Phantom is alternated between Anthony Crivello and Brent Barrett. 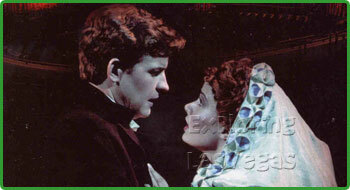 Christine Daae is portrayed by Elizabeth Loyacano and Kristi Holden and Raoul is played by Tim Martin Gleason. As in the musical and the novel before it, the Phantom falls in love, first with Christine�s voice and then he becomes obsessed with the rest of her. This engaging and mesmerizing love story is suitable for children ages six years old and older. With four seating areas available, there are seats for someone in just about every price range. You can catch Phantom once an evening or at one of two shows on Mondays and Saturdays. Parterre and Middle Balcony Seatings are $107.00; Orchestra & Front Balcony Seatings are $132.00 and Parterre & Middle Balcony Seatings are $107.00 for the show Phantom of the Opera. 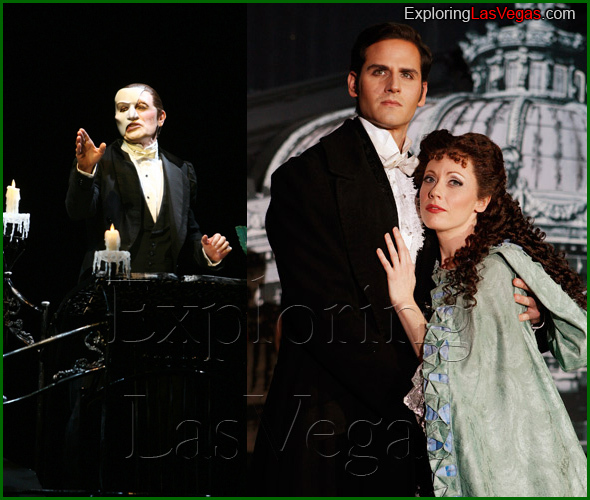 Phantom Las Vegas performance pictures. Watched the Phantom Show in Las Vegas ? Please share your experience with others. This show is worth watching just to see the amazing stage. The Venetian hosts quite a show. Phantom sticks true to the original story � no crazy interpretations, but definitely entertaining. The opening score gave me goose bumps. I love the music! Comparing to what I have watched one in Europe, it is little weak, overall I enjoyed it since I have listened the music CD of the Phantom of the opera many times and I knew the story, Well the sound suppose to be loud but I thought it was too loud, don't sit down at the VIP section since it is close to giant speakers, sit at the back and enjot the show. If you aren't into classical music or theatre this show maybe boring for you, but I liked it although the ticket prices I thought was little bit expensive. There are many reasons to go see PHANTOM � The Las Vegas Spectacular. This show was named the 2006 show of the year by the Las Vegas Review Journal and it is easy to see why. PHANTOM is based on the hit Broadway musical, The Phantom of the Opera, by Andrew Lloyd Weber. The show is essentially a condensed and minimally changed version of this show. Of course, it has a Las Vegas spectacular flair that has been added to it. Phantom Las Vegas is 95 minutes long. This makes the show upbeat, fast paced, and yet it is the same story you love of the Phantom and his infatuation for the beautiful French singer, Christine. This is a must see show for any Phantom fan. If you've seen the Broadway version so you think you do not need to see this, you should think again. The Phantom has never been quite as magnificent as it is in Las Vegas. PHANTOM Las Vegas Spectacular is held at the Venetian Hotel and Resort. Tickets go quickly so you want to get a seat while you can. The theatre was custom built for this production and the original creators behind the musical version of The Phantom of the Opera are responsible for the reworking of this show. If you love the music, you do not have to miss it. Every song in the original show is still contained within this reworked, Las Vegas version. They've just adapted, shortened, and reworked the entire script to make a new version you will absolutely love! To do this, the creators have added special effects and technological advances that were unavailable during the time when the original Phantom was written. What you end up getting is a brand new Phantom to delight a whole host of Phantom fans old and new alike!